It seems as though the grey days of January have settled in. There's a week of rain in the forecast and I'm ready to hunker down wrapped in flannel with a cup of tea and the book I've been reading lately, Delancey, by one of my favorite bloggers, Molly Wizenberg. The light in my apartment has been notably dim and moody. This calls for an abundance of post-rock tunes and warm, home cooked meals. I've been walking around in a blanket cape like the lazy superhero I am. Meanwhile, I've stocked up on veg broth and will be headed to the store later this evening to acquire a more than necessary amount of fresh root vegetables and dried beans to fill my new slow cooker with. So excited! 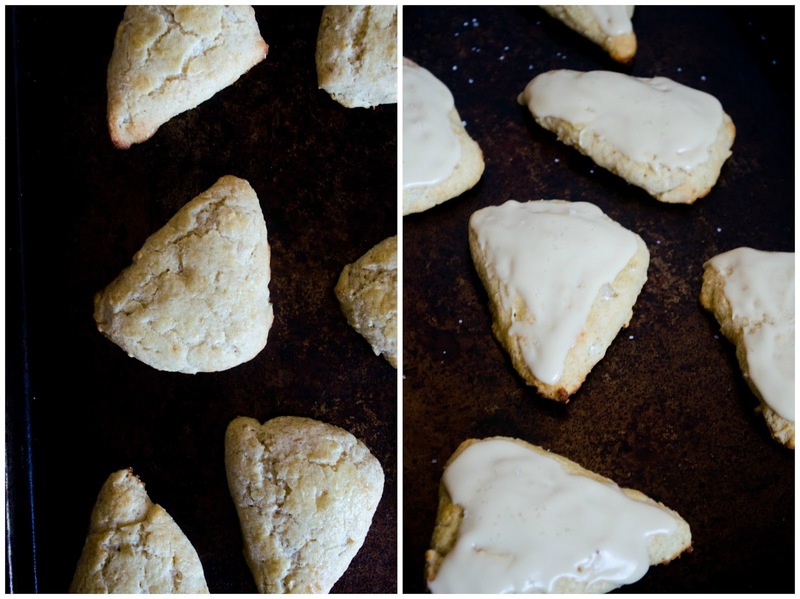 Scones are easy and do-able whilst wearing a blanket cape (I am living proof!). 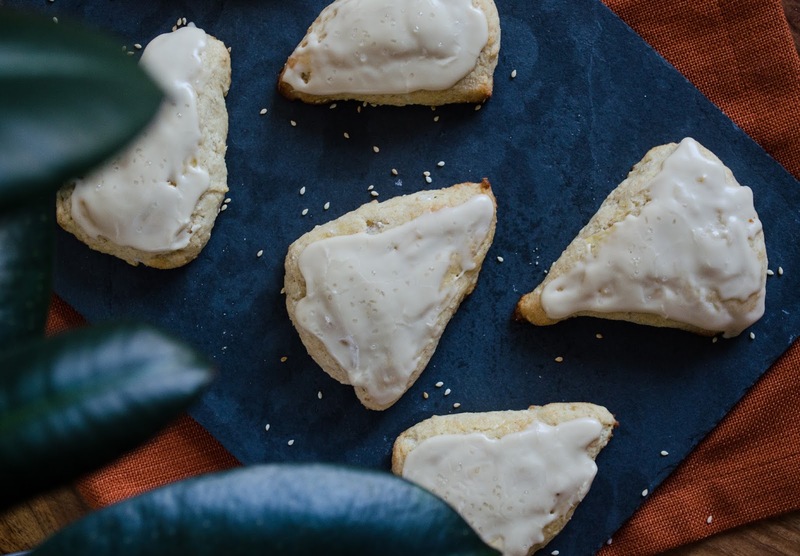 Plus, there's no better pastry to pair with your...5th...cup of afternoon tea. 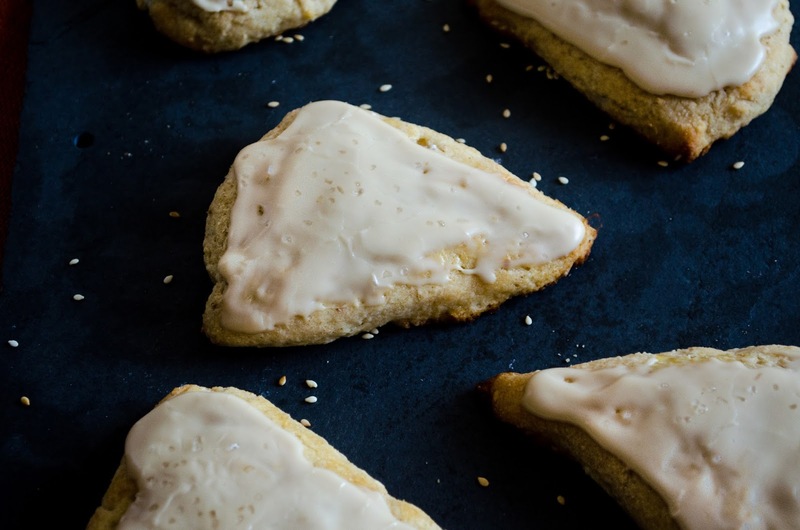 Here's a batch of white-miso sesame scones that are just as moody as the weather outside. I'm talkin' about that sweet LA breeze spiked with a few drops of salty rainfall. For the longest time, all miso was to me was the name of a soup I didn't really care for at sushi restaurants. Correct me if I am mistaken, but to me, miso soup is a bowl of salty broth with a few cubes of tofu (and maybe some green onions if I'm lucky) swimming in it. One year ago, when I started working at Intelligentsia, I found miso being used in a couple of the pastries we sell. 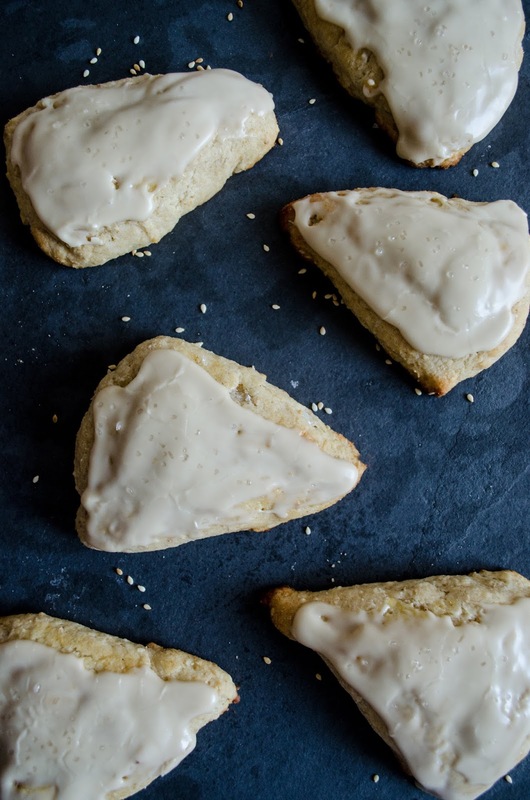 There's a white miso kougin-amann and a miso butterscotch cookie, both of which are pretty dang popular. At the time I was strictly vegan and couldn't touch these items, but would certainly stare down the trendy sweets in an effort to understand them. A few months later, I listened to First We Eat's Soy Fermentation podcast, which followed with an "ooooh" from me, and a better grasp at what miso is and why white miso pairs particularly well with sugar. Eventually, I tried the pastries at work. Shortly thereafter, white miso paste was scribbled on my shopping list. Miso is a fermented soy bean paste. There are three varieties of miso: white, yellow, and red. White miso is mild and delicate in flavor. It's fermented for the shortest amount of time and has a definite sweet flavor. White miso is very versatile and is commonly used in dressings, sauces, and of course — dessert. Contrarily, yellow and red miso are fermented for longer periods of time and are more salty and earthy in flavor. These varieties of miso might be your friend in a hearty vegetable stew, but if I were you, I'd stay pretty far away from using yellow or red miso in a dessert. 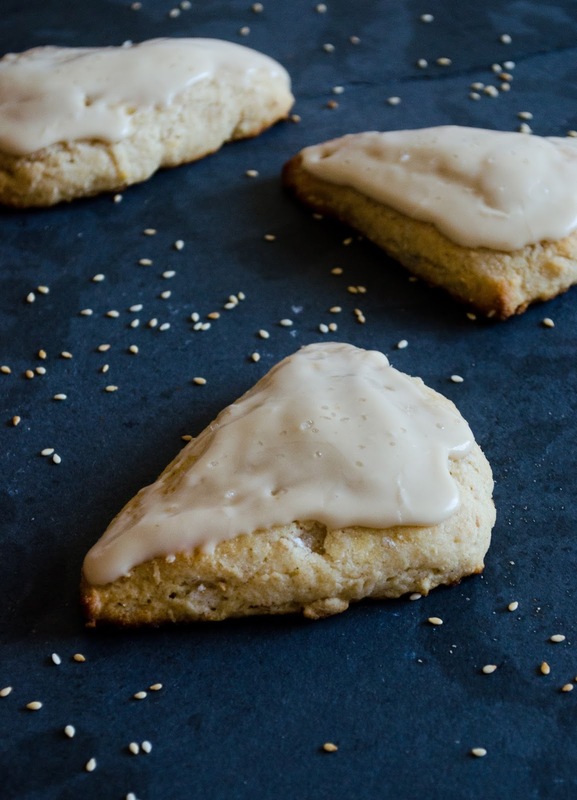 In brainstorming flavor combos for these scones, sesame seeds were a sensible pairing. A good friend of mine convinced me that the addition of maple would be ~revolutionary~. It was risky, but ohhh so successful! That being said: if for some reason this recipe makes it big for being innovative, then I definitely know who I'll be thanking for the idea. In the meantime, here's a playlist for a rainy day, or a rainy week in this case. 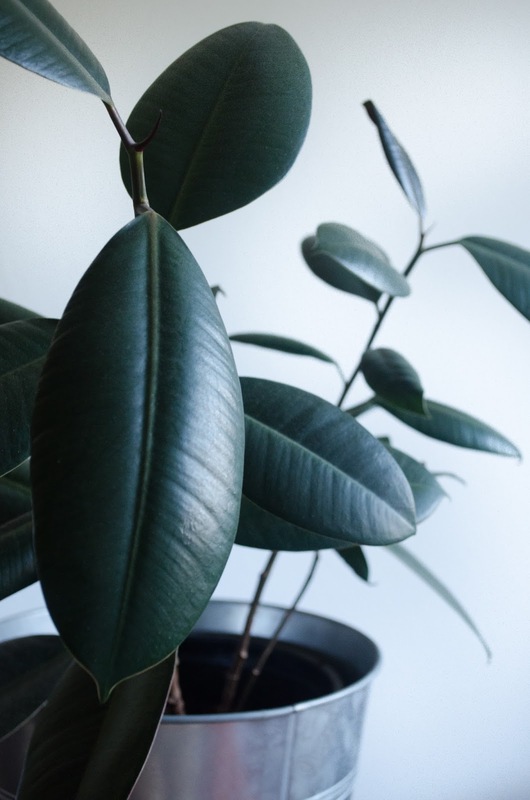 Keeping the vibes chill and the beats rolling to soothe your mind and keep your spirits bright even when the sky is not. 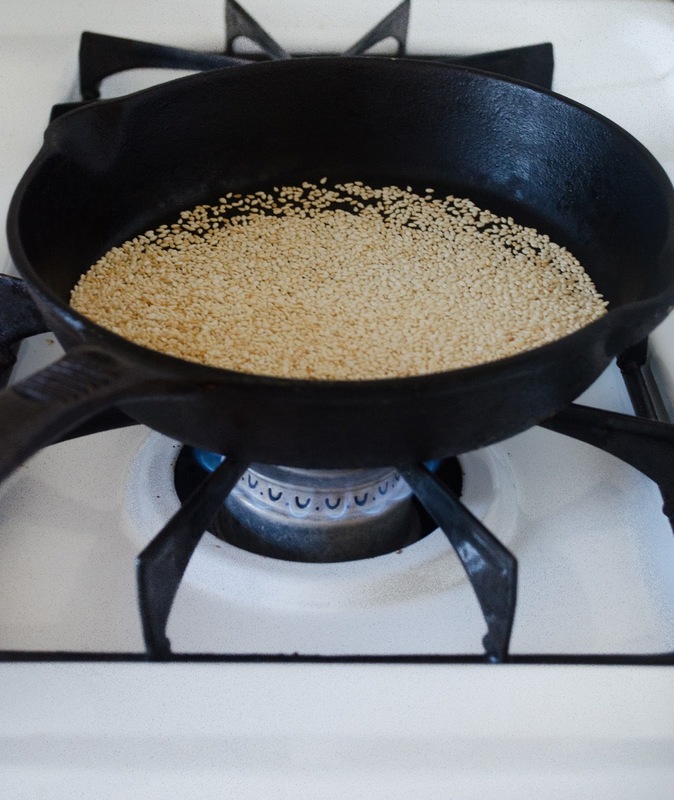 Toast sesame seeds in a small pan over medium heat for 2-3 minutes or until golden. Set aside to cool. In a large bowl, combine the flour, baking powder, baking soda, salt, and sugar. Stir to combine. Cut the butter into cubes and add them to the flour. Use your fingertips to 'rub' the butter into the flour until the butter is pea-sized. In a medium bowl, whisk together the egg and white miso until smooth. Add the buttermilk and whisk to combine. Make a well in the center of the dry ingredients and add the buttermilk mixture. Stir until just combined. Turn the dough onto a well-floured counter. Sprinkle sesame seeds over the top. 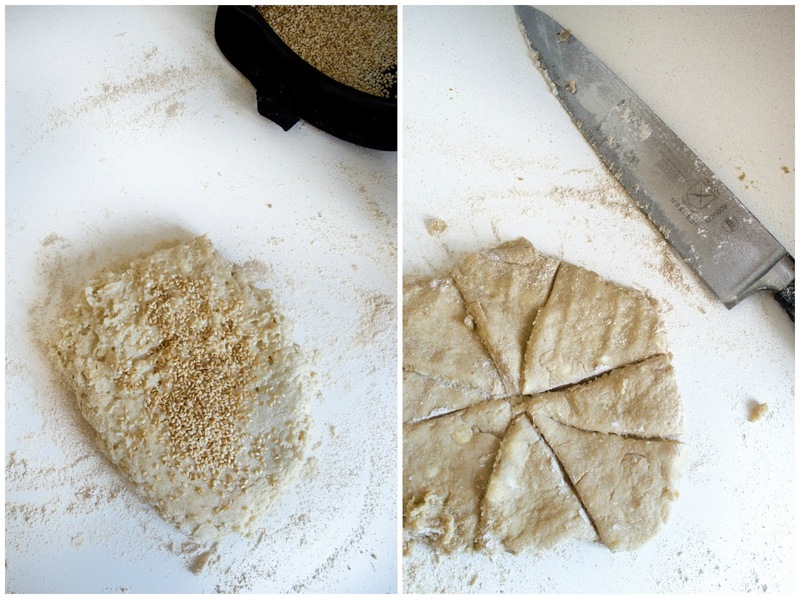 Flatten the dough a little and fold in half. Then, turn 90 degrees and fold in half once more. Next, divide the dough pat down into 2 round discs. Use a well-floured, sharp knife to cut each disc into 8 triangles. Place the triangles onto the prepared baking sheet and brush the tops only with remaining 2 tablespoons of buttermilk. 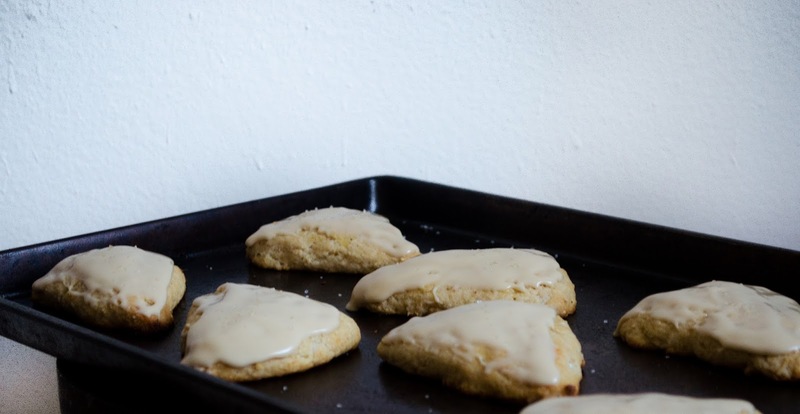 Place the pan in the oven to bake for 8-10 minutes or until the edges and bottoms of the scones are golden. Remove from oven and let cool completely. To make the glaze, whisk together powdered sugar and maple syrup. 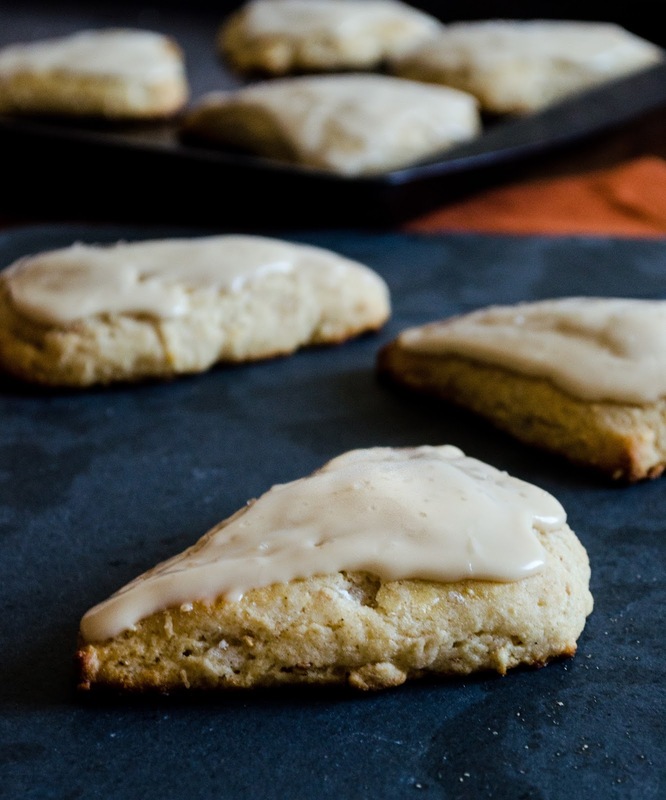 Use the back of a spoon to spread the glaze over the top of each scone. While the glaze is still wet, sprinkle sea salt on top.